Not to long ago I was faced with a space challenge in my very small kitchen. I needed more pantry space right away but didn’t want to spend a large amount of money for something custom in my kitchen. With 3 growing children who seem to endlessly eat I decided the most economical thing to do was to purchase a piece of furniture that could accommodate a small pantry in the designated space that I had. I needed something that was not to deep or to wide. I really wanted it to match my kitchen cabinets but I knew that was asking a lot so off I went to the consignment shops. I found nothing until I checked Craig’s List and found a old china cabinet that was in good shape and it was the perfect size for my space. I ventured out of my city and purchased the china cabinet from a family who was having an estate sale. The cabinet was a dark mahogany color, not the off white color I was hoping for to match my cabinets. Regardless, I was determined to make it look fresh and new. The lady I purchased it from told me that I had a great idea and wished me luck after I told her about my plans for the antique. She even told me a story about how her parents brought this cabinet over from another country and how it had been in the family for a very long time. I told her I would try my best to make it look nice. When I finally got it home I made my design plan. 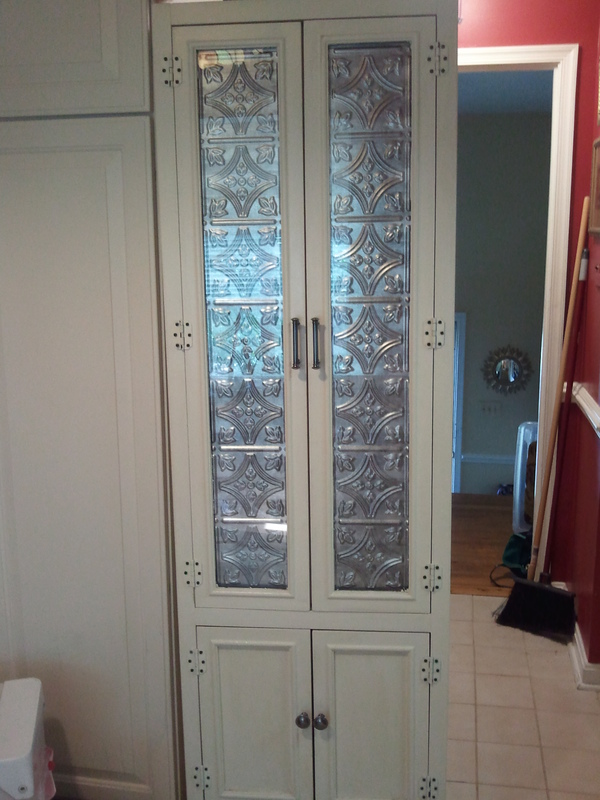 I knew that clear glass doors would not work well for a unsightly pantry. That’s when I noticed the stainless steel paneling behind my stove. I recently had installed those and knew that I could purchase some more that match the ones behind my stove. So off I went to Lowes. I purchased stripping materials to take off the dark stain finish. It was not a fast process but in the end it was well worth my hard work and effort. I picked out some modern stainless steel knobs and handles for the doors and painted the cabinet to match my existing cabinets. The stainless steel panels were cut and I duct taped them to the inside doors. After that I purchased some great tuba-ware storage. With a little bit of ingenuity and determination a old piece of furniture was transformed into a kitchen pantry. What once was a lighted display cabinet for fancy items and expensive collectibles was now a storage home for food. I hope I’ve inspired you to take a second look at what spaces in your home need more storage and then consider purchasing something old and making it new again. This entry was posted in Residential Organizing and tagged DIY, DIY organizing, Kitchen Organizing, Organizing a Pantry, Pantry Organizing. Bookmark the permalink.